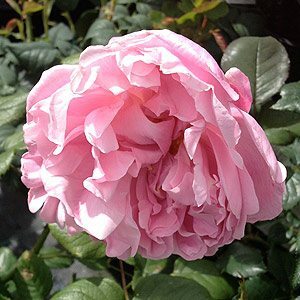 One of the all time great rose plants is the Mary Rose, a wonderful long flowering pink rose bush with a good strong fragrance as well. A lot of discussion about the name, however it was named after the Henry VIIIs flagship of the same name. So some 400 years after the lose of the ship we have a rose to mark its memory. A rose called ‘Mary Rose’ is sometimes a little difficult to find, it is of course a famous rose bush and a David Austin favourite. Grown widely in Australia and well known in the UK. Early flowering with fully double pink flowers the ‘Mary Rose’ rose is named after the ship and is also responsible for two well known ‘sports’, being Winchester Cathedral Rose and ‘Redoute’. Reaching around 1.2m -1.5m in height this is a very reliable rose for Australian conditions. Mary Rose is an early flowering rose, repeat flowering as well, prune in mid winter . Try a little ‘Dynamic lifter’ for great growth. If you are are planting a standard type use a stake to maintain good upright growth.